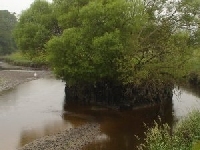 The Dub o' Hass or 'Pool at the Throat' as it translates from 18th Century Scots is the name given to the now derelict port of Dalbeattie, which lies three miles upstream from Palnackie Harbour. 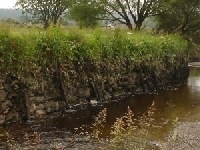 Here only the smaller vessels were able to reach Dalbeattie by the aid of horses as the bends in the river Urr were so sharp that ropes were also used to guide ships round. Today it is hard to imagine a boat of any size navigating the tortuous twists and turns of the River Urr as far as the town. A once thriving port and the hub of Dalbeattie's industrial past lies dormant and secret behind the remains of Biggars Mill. 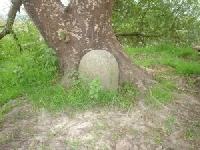 Age-old granite quay stones mark the path to the Dub o' Hass where an overgrown tree threatens the remains of the pier, its roots so deep that should it fall it will destroy a vital part of the towns heritage. 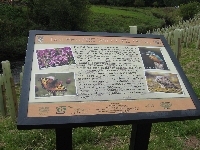 The timber remains are as clear today as when they were first placed over 200 years ago, although my photos do not do it justice. Dalbeattie Community Initiative raised money to start work on Phase 1 of the Old Port Restoration Project and in 2008 this first phase was completed. 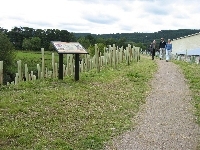 This included removal of intrusive tree roots around the Dub o' Hass, laying paths and planting young trees, and the installation of two Information Boards, one about the Old Port and the other about Wildlife in the area, linking the Old Port with the newly established Wildlife Trail around Dalbeattie, another of Dalbeattie Initiative's new projects to encourage visitors to the area. Why not visit the Old Port yourself and get the feel of Dalbeattie's seafaring days?